When you are delivering subscriptions to hundreds of thousands of customers for more than three decades you develop a profound understanding of how to attract, retain and increase the value of your subscribers. Although he became president and COO of Guthy-Renker, that has at least one billion-dollar subscription product, Proactiv, Georg Richter began his career with Double Day Book Clubs, then BMG music club before today, the CEO and founder of OceanX. Georg has been an executive at the highest levels of some of the largest, fastest-growing subscription businesses for the last three decades. And, for you, he reveals the biggest subscription mistakes to avoid, how to deliver value subscribers will eagerly pay to receive, and the single most effective strategy in jump-starting membership growth after it has plateaued. How would you like to sit down with a subscription marketing master to learn how to grow your recurring revenue? Well, today is your lucky day. Are You Making Any of These Common Subscription Mistakes? Too many subscription businesses are starting up with great enthusiasm and fading away faster than they started. To secure a good start, one of the first things to do is study the market. Find an area in the market, a niche, that has isn’t currently being served. Even though the wonderful byproduct of the subscription model is recurring revenue, you need to have a source of funds to get things started. You will have testing and development costs, shipping costs, marketing costs, etc. that will start before your first month of recurring revenue comes in. “The most important thing to understand is, it needs money, it needs upfront investment, it needs careful planning,” advises Georg. You need to be liberal with your media promotions and conservative with inventory orders. Whether you are a publisher competing against free information or sell physical products and you are competing against retailers, you are engaged in a constant battle for your customers attention, investment and on-going support. You will only retain your subscribers if you are delivering more value than everyone you are competing against. Here’s Georg’s go-to list of value building strategies he discovered after three decades of growing subscription programs. People expect value. They want to know that they got more value than they paid for. Your pricing strategy should fit the demand and quality of what you offer. Georg warns, “You must be interesting. Social media has changed everything. There’s lots of pressure, everything has to be upfront. There used to be hard membership rules, there used to be late fees. All of this is gone. The customer wins. You have to make it easy, and the most important thing is, the product has to be interesting. The relationship has to be convenient and easy. “The offer has to be clear, concise, and you need a call to action. If you have confusing web page and there’s no button with “order here,” you won’t get the order,” says Georg. This is something that I’m working on with many of my largest clients. When a membership starts, they really grow like gangbusters and then they plateau. What’s happening is that they try to be all things for all their members, and what some memberships are slow to recognize is that they have multiple types of members within their membership. There are different communities and different reasons why folks become a member and want to participate. The secret to growing large memberships is to think small. According to Georg, larger memberships have an easier time at this because they have more data, and it’s easier to find subgroups. While Georg has used this strategy in the largest subscription businesses in the world, I often implemented this with my clients. Heck, I learned it within associations that frequently implement “Special Interest Groups” to deliver special content and connection to a select group of members. When you get started, or even when you’re already months in to your subscription business, the to-do list never shortens. Avoiding the common mistakes, securing the value of your product or service, and making sure you’re reaching the different types of members you have are three good places to start. 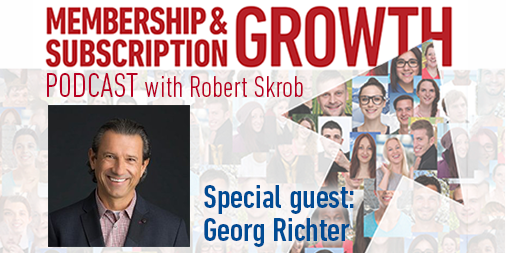 Georg has a wealth of information for the subscription business, and you can find out more by listening to the full interview on Membership and Subscription Growth. Subscribe to the podcast to discover the keys to recurring revenue growth from successful entrepreneurs in the subscription economy. Previous and upcoming guests include Robbie Kellman Baxter (author of The Membership Economy), Amir Elaguizy (CEO of CrateJoy), Dustin McAdams (CEO of PupJoy), Perry Marshall (Founder of Perry Marshall & Associates), Liz Cadman (Founder of MySubscriptionAddiction.com), Deena Bronz (Co-founder and CEO of KitNipBox), Tim Broom (Founder of ITProTV), and Babak Azad (founder and CEO of Round Two Partners)!